I asked and Castle delivered. 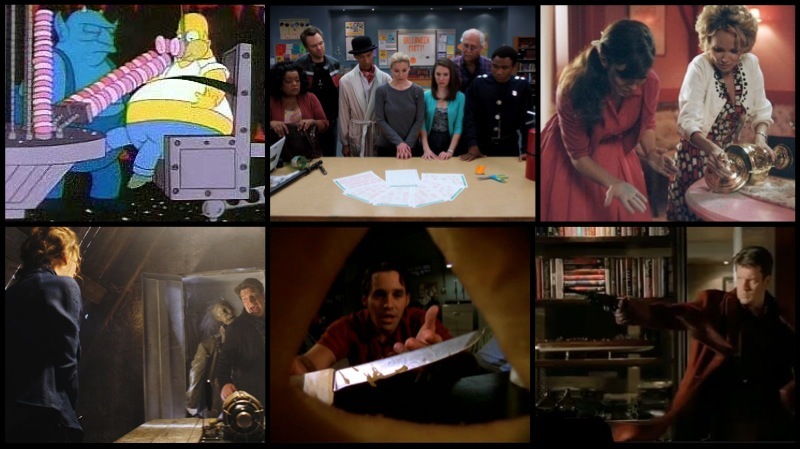 Let’s be real – this is by no means a definitive list of best – but these are 5 (ish) Halloween episodes of TV that we highly recommend you get around to watching this season. Are you ready for the Castle Premiere? Check out this Sneak Peek! Castle Mondays are almost back and here at The Viewing Party we’re counting the hours until our first Castle-party of the season this Monday evening! As you might have gleaned from the trailers things have gotten steamy between Castle and Beckett, and as one might expect, things goes from steamy to silly very fast. Check out ABC Premiere Week’s sneak peek of Monday’s episode featuring exclusive footage from Monday night’s episode. Skip to 1:14 in the video if you don’t care for “Dancing with the Stars” to the introduction. Alexis is hungover and Beckett is sneaky, click to watch the clip!. The season 5 premiere “After the Storm” airs at 10pm on ABC! Watch with us – we’ll be live-tweeting @TheViewingParty! While we are still not over the exhilarating events of this year’s season finale, we think it’s about time to take a step back and assess the season as a whole. There were a lot of ups and downs, no doubt about that, but this post will focus on the ups. 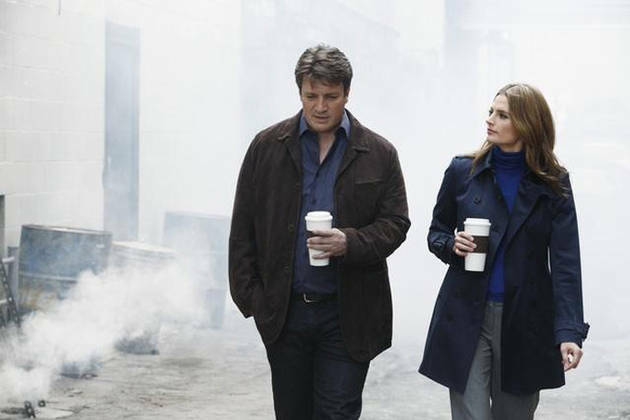 Here are our five favourite episodes from season 4 of Castle, in order of appearance. Enjoy! Things happened. Big things. Things that are meaningful and irrevocable and wonderful. So let’s jump right in as I try, like so many fans out there, to make sense of my Castle/Beckett feelings. We begin with Beckett clinging to the edge of a building, calling out for Castle as she loses her grip. Just as all hope seems lost, we cut to three days earlier. Oh, season finales. 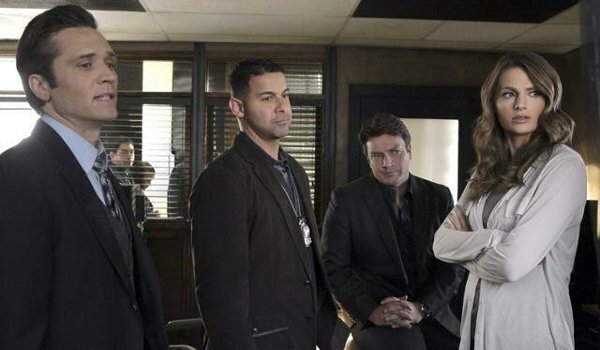 After discovering what appears to be a gang-related murder in an alley, Beckett, Castle, and the boys soon discover a link to Montgomery’s home and the files he was trying to keep hidden. Drama, stolen glances, and intensity ensue, highlighting how much Castle, Ryan, and Esposito love Beckett in their own ways. Each of them will do pretty much anything to support Beckett and keep her safe, and we see this play out throughout the episode. Of course, Castle is keeping a secret about the files and the case, and we all know that it’s only a matter of time until it comes out. We’re heading in the right direction, people. I mean, sure, we’re celebrating the fact that Castle and Beckett are even talking to each other at all, let alone talking about their feelings, but after the last few episodes we’ll take what we can get. It’s no secret that I was getting a little sick of the constant evading, concealing, and inability to communicate, and I was thoroughly fed up with Castle when he said this would be his last case working with Detective Beckett. I knew it wasn’t going to prove true, but somehow that made it even more annoying. Enough already! Now that I’ve gotten that off my chest, I can comment on the actual episode. I felt that “Undead Again” was all about one person knowing better than another and pulling the wool over their eyes. This plays out in the zombie storyline, but also more significantly in Castle and Beckett’s relationship. In terms of the zombies, we (or the characters) are fooled into believing that they might actually be the walking undead. When that theory is debunked, we see the case of one “zombie” being manipulated into committing a crime against his will and without his knowledge. See: pulling the wool over his eyes. As for Castle and Beckett, they simply can’t keep up their charade any longer, and there are many layers of the charade: first and foremost is the fact that they’re in love with each other and not acting on it, second is Beckett hiding from Castle that she heard him say he loved her last year, third is Castle hiding his knowledge that she heard him, and fourth is Castle hiding info about Johanna Beckett’s murder and Kate’s shooting (which will most certainly come up in the finale next week). As was to be expected, nothing in the way of relationship advancement happened in “The Limey”. However, I actually liked this episode better than last week’s for a few reasons, not the least of which is that we got some real character development on the part of Kate Beckett. While “47 Seconds” followed Castle closely through his childish reaction to finding out Kate’s secret, this week we go home with Beckett, seeing things from her point of view and gaining insight into the character. I wasn’t happy with the lack of discussion between Castle and Beckett (no surprise there), but watching Beckett grapple with her feelings is far more interesting than Castle pouting about her betrayal. 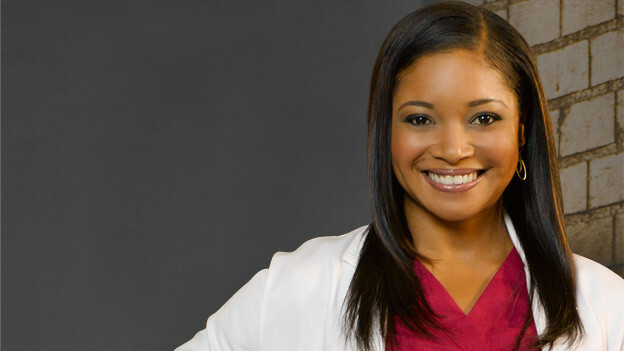 Lanie was really the best part of this episode in my opinion. She tells it like it is, and always has. She’s been aware of the attraction between Castle and Beckett from day one, and has never been shy about encouraging her friend to go for it with “writer boy”. In “The Limey”, we not only see her supporting Kate, but also confronting her about her feelings for Castle. And when she does, it doesn’t take long for Beckett to admit to those feelings. In the course of the initial conversation in Kate’s apartment, this moment happens almost casually, but it’s actually a huge deal for Beckett! She has been denying her feelings and declaring she isn’t ready for ages, so the fact that she owns up to being crazy about Castle is a really big step for her. We were all looking forward to “47 Seconds”. It was to be the episode in which something finally happens between Castle and Beckett. And while I suppose something did happen, it’s certainly not anything I am pleased or impressed with. I’m waiting until the end of the season for the writers of Castle to convince me that the events of this episode were justified, because right now they seem like yet another contrived device to keep the two main characters apart. Allow me to clarify. I’m not talking about Beckett’s secret coming out, because (a) that was bound to happen and (b) it is kind of a big deal. Beckett heard Castle say “I love you” after she was shot in last season’s finale, and neglecting to mention it to him for almost a year is on the list of things you probably shouldn’t do to the man you’re clearly in love with. 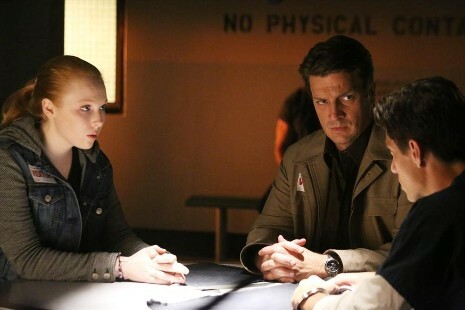 Thus the main drama of the episode is established, with a bombing setting the stage for Castle and Beckett to ponder how precious and uncertain their time is. It seems like the perfect opportunity for the couple to finally act on their feelings, make out, make babies, do all those things Stana Katic keeps advising for the characters. It was nice to have Castle back after a three-week hiatus, especially because this season seems to be flying by. While I could have done with a slightly more engaging plot, I will let that slide given the big things that seem to be in store for our favourite crime-fighting pair in the episodes to come this season. “A Dance with Death” was light and not particularly memorable, but had some small moments and side storylines that definitely deserve a mention. And so. To begin. For the most part, I was digging Beckett’s brightly-coloured wardrobe this episode. She’s definitely much more casual this season (and has been following an ever-increasing casual trajectory throughout the show) but we don’t often see her in those popping colours. From bright orange to electric blue to berry pink, this says a lot about what she as a character is comfortable with. Often when Beckett feels unsafe, threatened, or vulnerable, the dark colours and turtlenecks come out in great abundance. Here her wardrobe tells us that she is totally comfortable with herself, her job, her relationship with her co-workers, and her relationship with Castle. This might be lulling both Kate and the viewer into a false sense of security since I have a feeling one or both of the big secrets being kept by Castle and Beckett are going to come out before the end of season 4. But for now, hooray for colour!